Open seven days a week, RDV Sportsplex is a great place for Central Floridians to cool off and get fit all under one roof at their Athletic Club and Ice Den. This 23,000 square foot Sports Performance Center is equipped with over 450 pieces of equipment and three exercise studios for Strength & Cardio, Mind/Body, and Cycling classes. The facility also includes outdoor tennis and indoor basketball courts with leagues available for it's members, as well as an indoor aquatic center that is open to the public for group swim lessons, stroke technique and Lifeguard certification courses. Active kids will enjoy the Kid's Stuff that RDV Sportsplex Athletic Club offers. Fun and safe Mini-Fit Playgroups, tumbling, martial arts and summer camps help teach kids the importance of a healthy lifestyle. Camps include tennis, swimming, and sports performance training. Kid's Stuff also host birthday parties in the Kid's Stuff Gym on Saturdays and Sundays that include a mix of structured games and “free play”, while parents sit back and relax. Party include basketball, floor hockey, scooter races and parachute play. Kids can also enjoy a giant 40 foot inflatable obstacle course and rock climbing wall. Anyone age three and up can experience ice skating on the massive, climate-controlled skating rink. Just don't catch cold! The Ice Den recommends that you wear long pants, long sleeves, long socks, a sweater and gloves. A helmet is also suggested for the younger ice skaters. Skate rental fee is not included with admission. The Ice Den provides rental skates in various sizes from children’s size eight up to men’s size 15. Know someone interested in becoming the next Mighty Duck or Figure Skater? RDV Sportsplex Ice Den teaches Learn to Skate classes that helps beginners get comfortable on the ice in a fun and relaxed atmosphere. They also offer hockey and figure skating programs for all levels of skaters ranging from beginners to those in elite levels of competition. Private figure skating lessons are also available with one of their exceptional Ice Den coaches. The Ice Den is also a great place for teens to hang out in a fun and safe environment. Every Friday is Teen Night from 7pm - 9:45pm. Teens can enjoy ice skating, arcade games contests, prizes and a live DJ spinning today’s hottest music! Birthday parties can be celebrated on any day of the week in during the public skating schedule. Party packages include three hours in a private Ice Den party room, two hours of ice-skating, two large pizzas, unlimited soft drinks, and admission and skate rental for 14 guests. 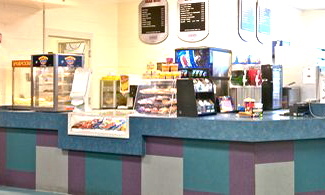 If hunger strikes while out on the rink, the Bear Bites Concession Stand can offer many snacks and drinks to choose from, including pizza, hotdogs, nachos and wings. They even serve soup, hot chocolate and Starbucks coffee to keep you warm when off the ice. Call ahead for hours of operation as public skating hours change week-to-week and month-to-month. Ample parking is available. RDV Sportsplex is located in Maitland just a mile west of I-4.